Market outlook with Trevor Greetham. He notes that the Investment Clock has been in a stagflation environment, with China-led growth slow down and inflation pressures forcing US interest rates higher, we witnessed one of the most volatile October's we've seen in the last few decades. However, he explains why he still sees the glass as half full at the moment. Trevor Greetham, Head of Multi Asset provides his latest review and outlook, updating listeners on the location of the Investment Clock and the positioning of the Royal London Global Multi Asset Portfolios (GMAPs). With the original Article 50 deadline just around the corner and a decision looming about which path we take next, Head of Multi Asset, Trevor Greetham, and Economist, Melanie Baker share their thoughts on Brexit. Trevor and Melanie will consider the impact the situation has had on the UK so far as well as the range of potential outcomes that are still on the table, from an extension to a no-deal or even no-Brexit, and what this could mean for investors. They will also share their approach to positioning funds during these unpredictable times. Watch the latest market views from Trevor Greetham, Head of Multi Asset, including our positioning using the Investment Clock approach and the impact of continuing uncertainty around Brexit. Head of Multi Asset, Trevor Greetham, highlights three areas as the investment clock continues to move from the stagflation into the reflation stage of the business cycle. With lots of reasons why markets dropped and investor sentiment extremely depressed Trevor still sees some positive signs that 2019 could start off on a slightly firmer footing, with a US recession not as close as some may have predicted. With the Brexit outcome still impossible to foresee, Trevor believes that a focus on diversification is key rather than trying to pick winners. Trevor Greetham presents his latest quarterly update. During the webinar Trevor looks at navigating market risks, discussing the potential of a w-shaped recovery vs a bear market, as well as sharing his thoughts on Brexit as we seek to weather the impacts of this known unknown. With dramatic developments in the Brexit story, we are in a fast changing situation with much at stake for the country and for investment portfolios. Trevor Greetham, Head of Multi Asset at Royal London Asset Management shares his views on possible outcomes and how they are likely to impact a range of investments. Trevor Greetham, Head of Multi asset examines the three myths around multi asset income and how to avoid any hidden risks in retirement. He explores potential investment strategies to sustain an income through retirement. He also provides an update on the positioning of the Investment Clock and the Global Multi Asset Portfolios (GMAPs). 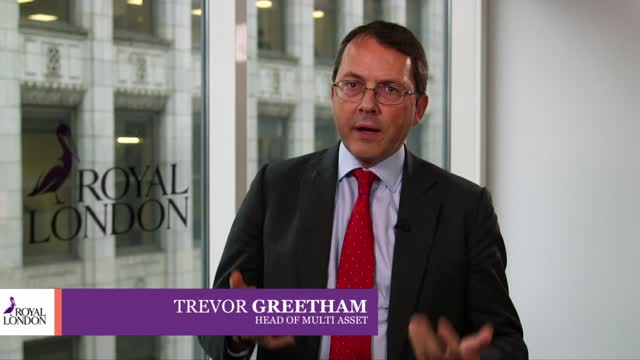 Trevor Greetham, Head of Multi Asset, explains why the Royal London Global Multi Asset Portfolios have their lowest equity weighting since launch almost three years ago. Equities are now close to benchmark with the emerging markets and commodities underweighted as the Investment Clock moves into mild Stagflation territory. Global growth is coming off the boil, but inflation is drifting higher, and the US and UK central banks are raising interest rates. Our monthly update from Head of Multi Asset, Trevor Greetham on the positioning of the Investment Clock and the Royal London Global Multi Asset Portfolios (GMAPs). Head of Multi Asset, Trevor Greetham will review the position of the Investment Clock and update on how this has been impacting the RLAM Global Multi Asset Portfolios (GMAPs). With the equity bull market in its tenth year, investors looking to draw income from their portfolio may be tempted to move away from stocks and seek yield in more exotic parts of the fixed income universe that could expose them to unexpected credit risks when the business cycle turns downwards. Trevor Greetham, Head of Multi Asset at RLAM, will explain how a multi asset portfolio can be used to generate a sustainable income while making use of tactical asset allocation and volatility management to manage downside risk. Head of Multi Asset, Trevor Greetham offers an update on the latest movements of the Investment clock and how this is impacting the positioning of RLAM's multi asset funds.